The Mind Museum, located in Taguig City, Philippines, turned 4 years old in March 2016. We are a non-stock, non-profit foundation, and the museum was built entirely from private donations. We sustain ourselves on our own operations, and we do not rely on any regular grants or funding stream from government or other institutions. We do this while subsidizing by 60% the entrance fee of public school students as well as teachers from pre-school to college. Our mission is clear: we want to provide an extraordinary, educational experience that inspires people to understand nature. From its planning stage in 2007 to its construction in 2010 to its opening in 2012 to the time of this writing, the 24-member core team of The Mind Museum has been pursuing our mission with passion, commitment, and results. #14 Life Below Water (A Glass of the Sea, Marine Camps, educ programs/events). We recognize that real and impactful education is essentially a shared effort between informal and formal education. We think that museums, whose strength and main attribute is “inspired learning”, can be a major partner of formal educational institutions in reaching the Sustainable Development Goal of Quality Education and Teacher Training. This is why we made the training for public school science teachers across the country our flagship educator program. We partner with sponsor organizations like Globe Telecom, PASAR, and even a Math Park in Busan Korea, to hold “Science Wonder Workshops: From Duty to Wonder” in the museum and in different provinces across the many islands of the Philippines. So far, we have conducted workshops for about 300 teachers in the museum, as well as in Pangasinan (Luzon), Leyte (Visayas), and General Santos (Mindanao). The official feedback from post-workshop surveys showed a complete turn-around in attitude about teaching science for the participants, as well as a newfound confidence in communicating science and accessing reliable sources of scientific materials for teaching purposes. The rest of the year will be devoted to workshops in nine more provinces. “Sustainable Cities and Communities” find a champion in The Mind Museum as well with a major exhibition on Future Cities, where we feature all the renewable energy sources that could possibly fire up future cities. We did this with Shell Philippines, veering away from promoting conventional fuel sources to advocate for renewable energy sources. We also hold talks and discussions with scientists and urban planners about what communities can do to shift gears when it comes to city consumption. Additionally, we partner with science-based conservation organizations to hold regular Café Scientifique sessions on sustainability, such as “What on Earth Are We Doing on Earth Day?” and “On Behalf of the Wild,” a discussion on sustainable eco-tourism on June 25, in the museum. “A Glass of the Sea” (AGoS) is our contribution to the Sustainable Development Goal of Life Below Water. 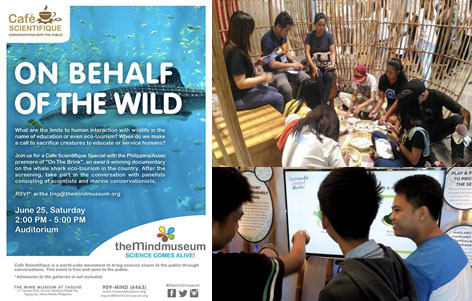 With support from a PEER Grant from the United States Agency for International Development, The Mind Museum conceived and created a traveling exhibition on the staggering beauty of the Verde island Passage, the apex of the Coral Triangle which is the most diverse marine environment in the planet. It also highlights the research being conducted by the California Academy of Sciences in the Verde Island Passage. To date, AGoS, which opened in July 2015, has travelled to various parts of Luzon, Visayas, and Mindanao, and has been visited by over 50,000 people. Research conducted among those who have seen the exhibition reveal that so far, those who have seen it learned from it and were moved by the exhibition to do their part in protecting our seas. The Philippines is a country of over 100 million people where about 35% are 14 years old and younger. We have a very young population that needs to be educated in a multidimensional way if our country hopes for a better, innovative, sustainable future. Education is too important to leave to schools alone. The Mind Museum, like any science museum or center in the world does, elevates certain pieces of the curriculum and of everyday things and puts them on stage so that anyone who witnesses them, gets to discover and rediscover the wonder, joy, and necessity of understanding. If books, as Kafka said are the “axe for the frozen sea with us”, a science museum is our collective clarifying lens for the complex processes we all live in. And it even does it in color!